The Rebel Sweetheart. : The Face Shop | 10 Years of 'Natural Story'. Motherhood, fangirling, and everything else in between. Writer, wanderlust, skincare junkie. I love coffee, Korean dramas, mixed martial arts, and Bruce Lee. 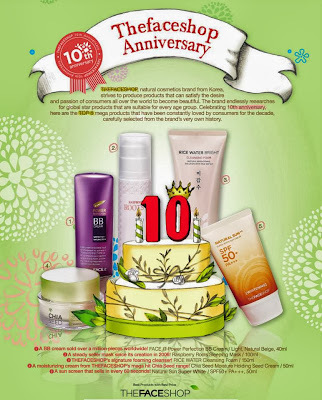 The Face Shop | 10 Years of 'Natural Story'. I must admit, the main reason that I started buying and using The Face Shop products was because of their poster boy, Kim Hyun Joong. He was my favorite Flower Boy (from the hit 2009 drama 'Boys Over Flowers'), my favorite among the members of SS501 (his now defunct boyband), and one of the first Hallyu stars that I literally went gaga over, lol. 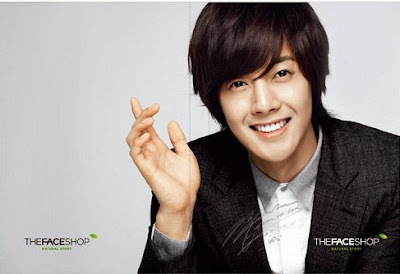 Moving forward, Kim Hyun Joong has been endorsing The Face Shop for the past three years. Launched in 2003, the brand opened its doors to the public with its very first branch in Myeongdong, South Korea, and has since become a household name in the global beauty industry. 'Natural Story' was the brand's concept, and it was as simple as it could be. 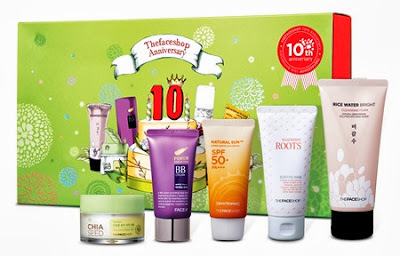 The Face Shop wanted to share the benefits of nature, and together with science, deliver the best products for the skin. Taking pride in using only the highest-quality, all-natural ingredients, The Face Shop also boasts of products that are reasonably priced for the modern woman of today. Their successful line of skincare and cosmetic staples is testament to worldwide consumer loyalty, and product effectiveness. It's been a decade since that fateful day in Myeongdong, and to commemorate this glorious occasion, The Face Shop has released a 10th Anniversary Limited Edition set containing five of their most popular, best-selling products of all time. Happy Anniversary, The Face Shop! Natural Sun Super White SPF50+ PA+++. The brand's signature sun care line. Since its release in 2006, the Natural Sun AQ line of products has seen additions and evolution due to advancements in sun care technology. Nine products comprise this trendy sun care line with each product empowering consumers with sun protection plus added skincare benefits based on their activities and needs. Koreans are known for incorporating mask sheets in their daily beauty regimen, and The Face Shop's 'Real Nature' and 'Raspberry Roots' masks are consumer favorites. The 'Real Nature' line sells over a million pieces globally per month while the 'Raspberry Roots' line is a favorite among international customers since its release in 2006. Staying true to its commitment of providing effective and affordable skincare products, the brand’s famous 'Herb Day 365' and 'Rice Water Bright' cleansers have remained at budget-friendly prices for 8 years in a row. These products are best known as long-lasting cleansers that have superb brightening and cleansing powers with instant results guaranteed. Chia Seed Moisture Holding Seed Cream. One of The Face Shop's signature skin care lines, Chia Seed is armed with an eco-friendly concept and packed with premier hypo-allergenic quality ingredients. The Chia Seed Moisture-Holding Seed Cream, which keeps the skin soft and hydrated 24/7 by sealing in moisture, has been a steady best-seller since its release last year. FACE IT Power Perfection BB Cream. One of my favorite BB Creams of all time (I even regard heralded this as one of my HG BB Creams), and the number one selling product in the brand’s BB cream category. More than 1 million pieces have been sold since it was first introduced in the market, making it a legend among consumers - a hit in countries like China, Southeast Asia, and Japan. Selling at Php 1500 (around $34) here in the Philippines, this Limited Edition Set is now available at all The Face Shop outlets worldwide. This looks like a good collection! Koreans always seem to have such fantastic skin. Chia seed? Wow! I love that you have an explanation for each. Thanks for this post! I've heard a few good things about rice water so really interested. I have the FaceShop baked shimmer blusher and it's my all time savior. Maybe I should try their other products as well. Thank you for letting us know about their limited edition offering. That is an awesome price for all that! I think I'd really like the mask. I haven't tried them Happy 10 years and many many more! Fun! Sounds like a great package...I love trying out boxes with various products. I have never heard of this brand at all--is it sold in the US? I will go check out the site to see if they at least ship to the US at a price that is affordable. Or maybe they sell it at the Korean Grocery store not too far from where I live. These look like great face products! I knew it. Best skin ever. Please share with the United States! Oh wow, P1500 is reasonable for all those products! I hope I can grab a box. The Face Shop has gone a long way and their strength is having natural products which is much safer. Min Ho is my favorite. But I like the song "Love Like This" of ss501. anyway, Gonna have all of those prod for only P1500? Sulit yan ah. Spotlight | Althea Skin Relief Calming Cream + Althea Waterful Green Bamboo Pads. Sneak Peek | Miniso x We Bare Bears Collection. Spotlight | Missha Superfood Apricot Seed Lip Scrub. Spotlight | Clio Kill Protection Sun Base. Fashion Pulse | About Shop Patches. Seoul Searching | 7 Must-See Spring Festivals in Korea. Spotlight | Laneige Dream and Glow Lip Care Set. Seoul Searching | Cartoon Street + Seoul Animation Center. Awesome Ways to Style Your Quote T-shirts this Summer. Scent and Attraction: How Certain Smells Create Chemical Reactions In The Mind. Five Theories for the Perfect Sleep. Wordless Wednesday #61 | Intramurals. Foodie Goodie | Jack Skellington Cupcakes. Wordless Wednesday #60 | Dance Practice. Foodie Goodie | Carrot Cupcakes. EZRA | The First Capsule Collection from ZALORA. Wordless Wednesday #59 | Music and Arts. Foodie Goodie | Beef & Rotini. Wordless Wednesday #58 | Adventure Time! Trend-spotting | Red is in for Autumn 2013! Foodie Goodie | Spaghetti Aglio Olio. Wordless Wednesday #57 | Wedding Fair. If you've ever been to Disney, you may have chosen to buy in to the Disney Vacation Club. Did you know you can sell Disney timeshare when you’re no longer interested in owning it? Nowadays it’s easy to sell timeshare when you work with a licensed timeshare resale broker.